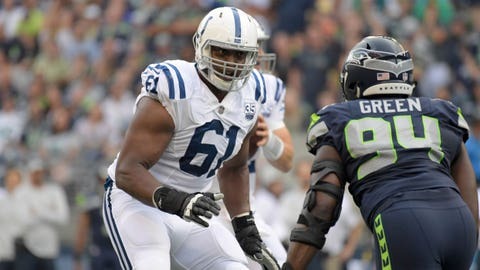 INDIANAPOLIS — The Indianapolis Colts have re-signed backup offensive lineman J’Marcus Webb. The 6-foot-7, 331-pound veteran started last season’s opener at right tackle but was placed on season-ending injured reserve on Sept. 11. He was a seventh-round draft pick of the Chicago Bears in 2010 and started 65 games during an eight-year career that included stops with the Vikings, Chiefs, Raiders and Seahawks. Webb becomes the eighth free agent to re-sign with the Colts, something general manager Chris Ballard has repeatedly said would be a priority. Indy has signed only two players from outside the organization — former Carolina receiver Devin Funchess and former Kansas City linebacker Justin Houston.